So I want to start this post off by saying that I feel incredibly honoured to get to wake up next to my intelligent and witty best friend everyday. Its also a massive bonus that he happens to be extremely lovely to look at (a fact he still isn't very convinced about). So I have this embarrassing story that I tell to new people about our first two dates. What is forever imprinted in my mind is not what flowers he bought me, what restaurant we went to, or even what our first kiss was like (although THAT was pretty magical, if I do say so myself). It was what he was wearing that I'll never forget. Green slacks and a red jumper. I kid you not. And then he wore the same weird outfit, two dates in a row?! When I opened my front door, to this SUPER handsome man in the same odd outfit again, I had to ask what the deal was. Apparently, he didn't intentionally mean to dress like a novelty Christmas present. The slacks and jumper were legitimately the nicest clothes he owned at the time and so he had worn them to both dates to look his best for me.... Cue the awww's, the soppy feelings and a much needed shopping trip. And this was how our love affair began! Fast forward eleven years and I still take much delight in helping Ben choose some of his outfits. And while time has seen him develop a slightly hipster, somewhat hippy and totally cool style all of his own as well, he is always more than happy to let me give him some styling pointers. So taking a break from our usual blog program of, well, my outfits, this week Ben has stepped out from behind the camera and I'm trying my hand behind it! Australian fashion label Johnny Bigg launched an online store almost a year ago and now has four shops open across the country, with two more on the way (the first in Queensland coming soon!). Johnny Bigg has been consistently releasing high quality collections of fashionable pieces for the big and tall man, so when they said they were interested in a collaboration together, I knew exactly which pieces I wanted to show Ben. The JB team were kind enough to let us choose two outfits, so Ben had a browse online and chose one casual and one dressed up look. The best thing was, we could get everything we needed for an entire outfit from the Johnny Bigg website. From tie-clips to shoes, Johnny Bigg is a one-stop shop for the tall and plus-size man in your life. And since they stock up to a size 7XL, they are selling to that niche market that has long been excluded from affordable and mainstream, on trend fashion. On Sunday we went out in the late morning for breakfast and Ben wore his casual outfit. 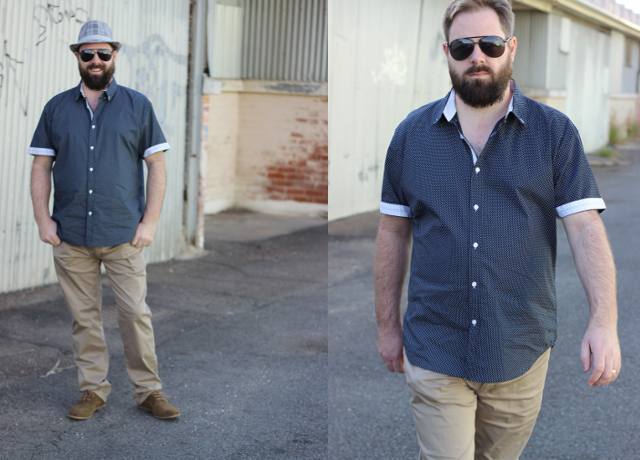 This chino and collard shirt together is an easy, smart look for a trip to the pub or a weekend BBQ. It's just dressy enough to get you into the swanky places, but still comfy enough to wear everyday. With shopping online, there is always that added fear that the sizing will be off. We used the handy online size guide and measuring instructions to find what was going to fit Ben best. They were super easy to follow and as we found out, bang-on size wise. Ben has an average shoulder width and carries most of his extra weight in his mid-section. Because of this, shirts that fit well over his belly are then often too baggy in the arms. Well Johnny Bigg have nailed the cut issues for bigger guys. This navy, spot print Deuce Shirt is a perfect fit for Ben in the 2X. For those of you with vertically blessed man-friends, Johnny Bigg also carry a 'tall' and 'long' option. It gives the wearer the same great cut in a longer length. This feature is going to be particularly helpful to those guys with longer torsos, it's nearly impossible to find a good fitting, longer length top! The killer chinos he is wearing are a size 40 (in the regular length, not tall) and are straight out of the pack. In a perfect world we could take them up half an inch, but at 178cm tall, I'm pretty happy with the length of these on Ben. The colour is a deep sand and has washed well, with no noticeable fading yet. And the best bit? They come with a free belt! I was most impressed with the shoes. Obviously the brogues style of the Berkley Suede Laceups was an instant hit in our household and the rich caramel colour is going to be so versatile. But Ben is usually so hard to buy shoes for. He's like the princess and the pea in the shoe department, it only takes the tiniest off seam or the slightest heal pinch for them to end up in the rejected shoe pile. Well he liked these so much that not only was he happy to wear them all day, they are also getting packed into his suitcase this weekend for a trip to Melbourne! I've always been a sucker for a man in a suit, and Ben certainly doesn't disappoint in the dapper department. 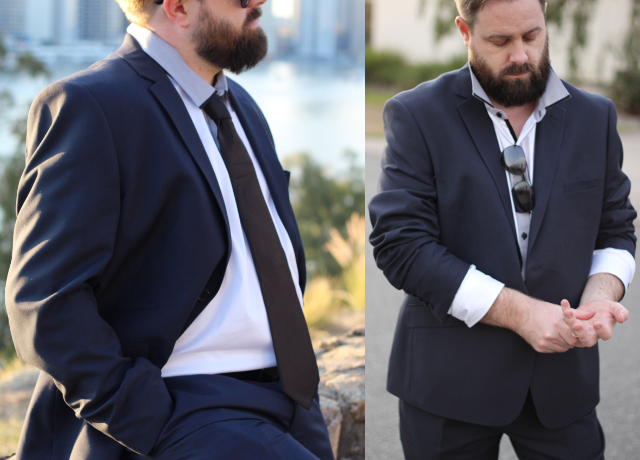 The Kurt Suit is a dark navy and I know it's going to see a lot of wear this coming Spring. It's made from a viscose, polyester blend and is the perfect weight to transition through the seasons. The jacket has a double button closure, three front waist pockets and a chest pocket. Ben is always storing little bits and bobs in his pockets and he was a big fan of the included THREE (!) inside jacket pockets. I loved the luxe, satin feel of the polka dot lining. It's the attention to detail like this that makes an item so much more than just 'clothes'. The jacket arms were a bit long, but as I mentioned when talking about the shirt fit, that's not unusual for Ben's shape. But a centimetre or two to tailor up is always easier than trying to find and unstitch a few extra. The Johnny Big clothes are the closest Ben has had to a perfect-fit. Their cuts have a quality and style that often is not present in 'straight off the rack' fashions. 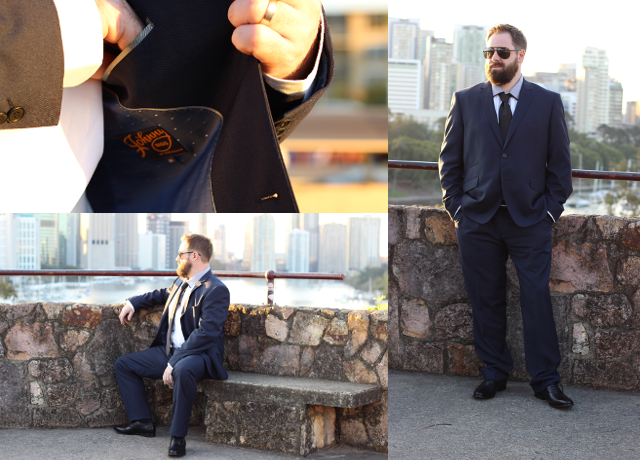 One of the greatest things I've learned about dressing for your shape, is that a tailor is your best, secret weapon. Every body has a unique and individual shape and obviously, you look best in things specially designed to accentuate that. Indeed, the majority of Ben's wardrobe is custom made work shirts that we have picked up during overseas travel. Knowing a new top is now only a few clicks away has made clothes shopping much more appealing to Ben! The basic black tie and smart loafers were a perfect combination with the dark suit. I asked Ben to consider these key pieces in his chosen outfits because I know they are going to get so much wear. You can never underestimate the appeal of a man in a great pair of shoes or a black tie, both pieces are total wardrobe staples. The shoes are a classic angled toe shape with stitching detailing that always makes for chic look. The upper and lining are real leather so after a few hours wear they fit like a dream. We had spent the rest of the day wandering around town and playing with the camera. Understandably the full suit ended up getting a bit warm for the sunny afternoon, so Ben loosened his tie and popped the collar. I love the grey stripe and contrast buttons on the Ellis Shirt; Ben was able to ditch the tie and still look dressed up, ready to hit the town. 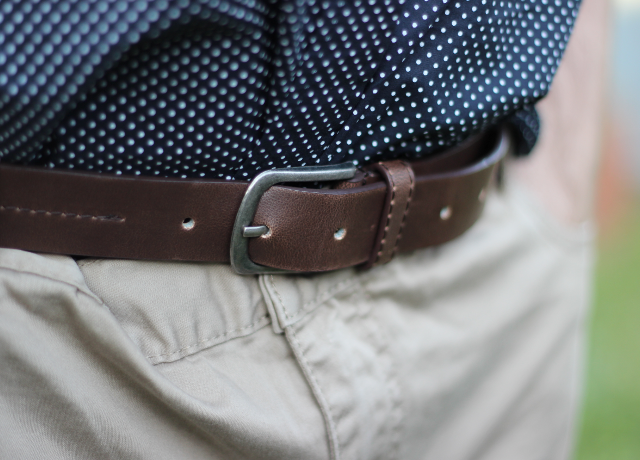 It's details like this that make a mans outfit. Overall we were both very impressed with the cut, quality and value of the Johnny Bigg range, so much so that we have already snapped up a few bargains in their current sale! This may be the beginning of very dangerous friendship! What do you think of Johnny Bigg's range?? The leggings I was already wearing under my (short!) Supergirl costume and the jersey mini-skirt over the top is my new favourite thing to wear. Its basically undies on the outside. We wear undies to cover our crotch and undies on the outside (/jersey skirt) to cover the shape of our covered crotch. Try saying that ten times in a row. Anyway, I feel a little less naked when I wear one over my leggings. The polka-dot tank and the grey cardi are both BooHoo bargains. Each piece is going to set you back $16! And I've lived in them the last six weeks or so. Seriously. I picked this outfit up from a pile of clean washing by the door. And around it goes again! And of course these shoes. These heavenly, wide fit, strappy sandal wonders! I love that you can get New Look wide fit shoes at ASOS. These babies went on sale for $30 and a hot second later I'd snapped them up! Its taken a few wears to get them sitting right, but the break-in has been worth it for a comfy extra two inches! What do you wear on an ordinary day?